More than two dozen motorists who filled up with an alternative fuel at a San Jose Chevron station last weekend found their vehicles were damaged by a contamination in the gas. Kris Sanchez reports. More than two dozen motorists who filled up with an alternative fuel at a San Jose Chevron station last weekend found their vehicles were damaged by a contamination in the gas. At least 25 customers who used one Propel Fuels pump at a Chevron on Capitol Expressway within a two-hour span noticed their vehicles going haywire. Many of them immediately went to the mechanic across the street. The mechanic working on the cars said some fuel tanks and injectors need to be replaced. The fuel, he said, had a blue tint when it should be clear. It's not exactly clear what was contaminating the fuel, but sales were stopped when the problem was discovered. More than two dozen motorists who filled up with an alternative fuel at a San Jose Chevron station last weekend found their vehicles were damaged by a contamination in the gas. Ian Cull reports. Martin Lord was hoping to buy some of the ethanol-based fuel on Wednesday night, but instead had to get regular gasoline. "It's the first I hear that there's been issues, so I'll be a little bit watchful for awhile," Lord said. The CEO of Sacramento-based Propel Fuels told NBC Bay Area crews have checked every one of their pumps since the incident and haven't found any irregularities. "We’ve been working diligently to find out what happened, and our priority is to take care of our customers," Rob Elam said. "We’re working with them to ensure there’s no further impact." 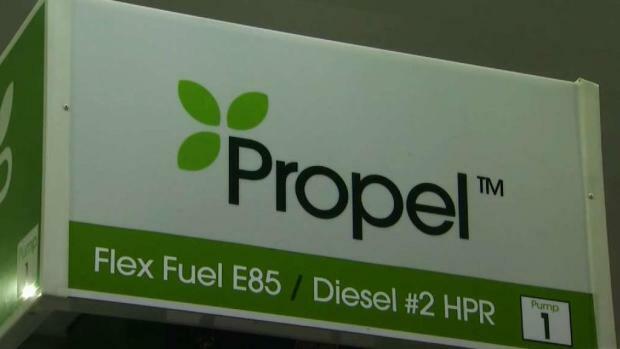 Propel Fuels rents the space from Chevron and said the gas station was not affected. The company is paying for the customers' repairs and rental cars as it investigates what went wrong. "I can't imagine," said Micah Dearth of San Jose. "For me, living paycheck to paycheck, having something like that happen and having to fix my car out of the blue would just be terrible. Sounds like they fessed up to it and did what they should do, and that's what you would hope for." Elam said the contamination was limited to the one pump, which gets its fuel from a small tank. He added that there are some very specific processes his company follows to analyze the fuel.